March is National Cheerleading Injury Awareness Month! 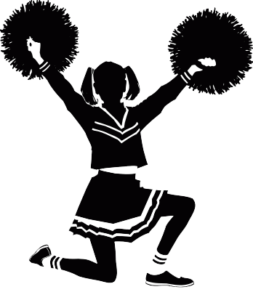 Not only is cheerleading becoming more popular among all age levels, it has also become a major cause of sport injuries in the female population due to the inclusion of stunts and gymnastics in the routines. The most common sites for injuries include the wrists, the shoulders, the ankles, and the neck. Due to the age of the participants, a lot of the responsibility for injury prevention falls on the coach. It is important for all coaches to be aware of the rules of the sport as well as the proper techniques used for lifting and flying in stunts. Proper hand placement of the bases and spots is key to ensure ankle injuries are avoided in the girls who are flying. Improper hand placement can also lead to wrist and shoulder injuries in the girls at the bottom of the stunt. Although knee injuries are not among the most popular sites for injuries, they do occur and are more common in the female population. Coaches should watch their athletes land from jumps, dismounts, and tumbling sequences. The goal is to land all of these with the knees directly over the feet. If the athlete has increased weakness, she/he may land with the knees close together and inside the feet. This type of landing can lead to knee injuries such as ACL/MCL sprains/tears. Proper conditioning is a key component to preventing injuries. Coaches should include time during each practice where the athletes participate in specific exercises to promote core, arm, and leg strengthening. It is also important to incorporate endurance training to ensure the athletes are performing at their best – injuries are more likely to occur when they are tired and more careless with their form. So coaches, cheer your way to a VICTORY by keeping your team educated on the proper techniques as well as keeping them strong and fit for the high physical demands that are needed for a perfect routine.